From far away, wine lovers romanticize about the process of making wine. 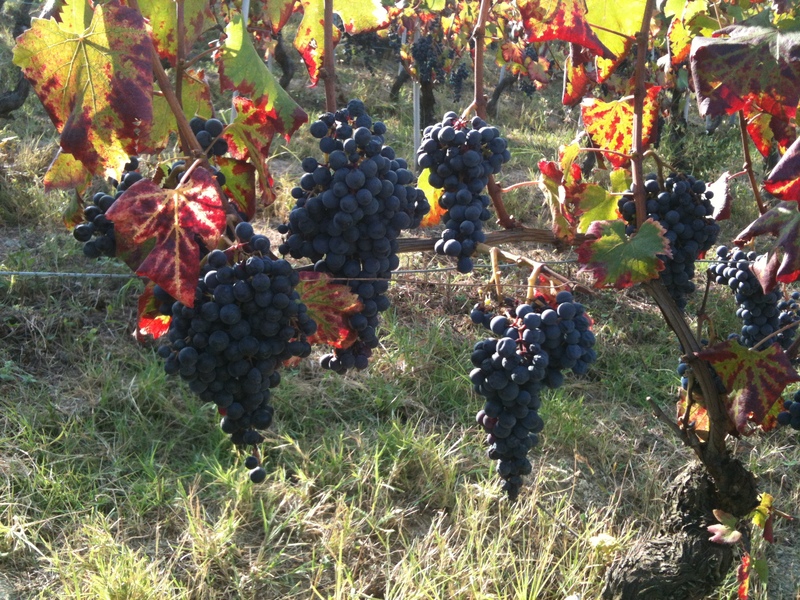 They long to participate in a harvest, to experience the crush of vinous fruit and inhale a winery’s intoxicating, musty odors fermentation creates. Yes, the transformation of fruit into fermented juice is a magical experience. For those whose connection with wine is primarily the vinous stream from a bottle poured in their homes or at a restaurant, it’s a bit of a fantasy. I urge wine lovers to experience a harvest, since to do so is to understand the high risks, the incredibly difficult, stressful work and the sheer joy that comes with producing wine. In short, it’s an experience that enhances appreciation of the men and women who toil in vineyards and wineries across the globe. One of the best places for such an experience is Cascina delle Rose in Tre Stelle, deep in the heart of the Barbaresco appellation. Vineyards below Tre Stelle in the Barbaresco appellation. Since the mid-1990s, Giovanna Rizzolio has been welcoming visitors to her agriturismo by the same name. 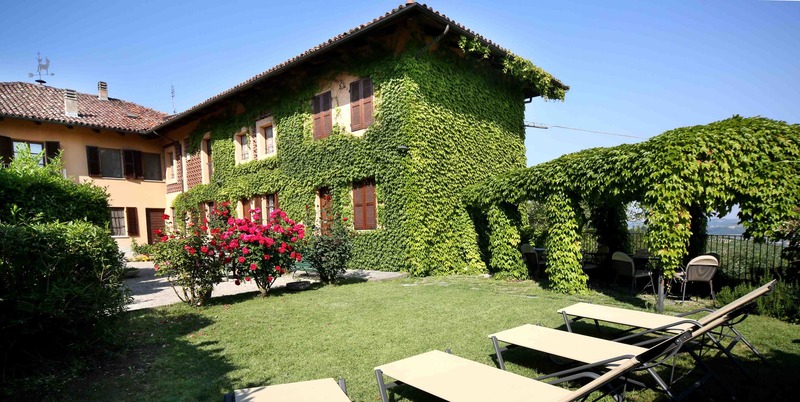 She was one of the first in the Langhe to provide lodging of this type. Soon, some of her guests – particularly Oregonians – began returning to help her bring in the grapes from her 3.6 hectares. Cascina delle Rose agriturismo in Tre Stelle. 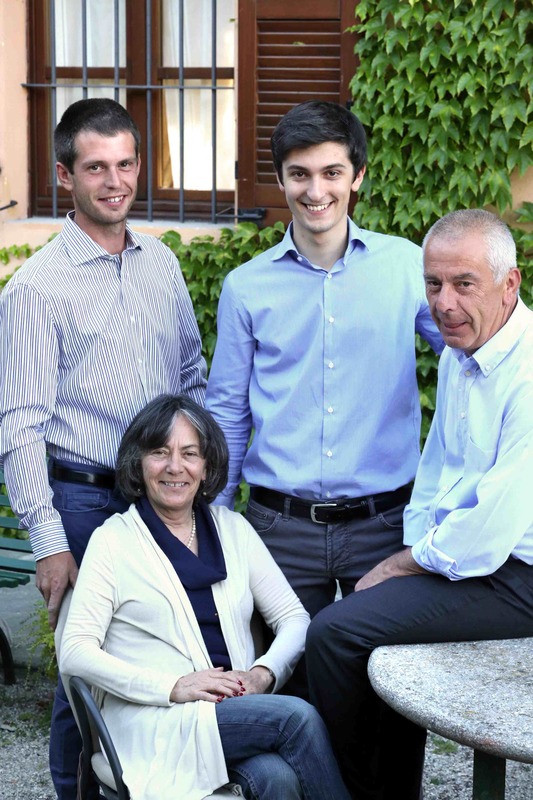 Twenty years later, Giovanna with her husband Italo Sobrino and their two sons, Davide and Riccardo, tend to Cascina delle Rose’s vineyards and make excellent wine below their home and the agriturismo’s rooms. Lots of life happening under one roof on three levels! Giovanna her two sons – Riccardo and Davide – and husband Italo. 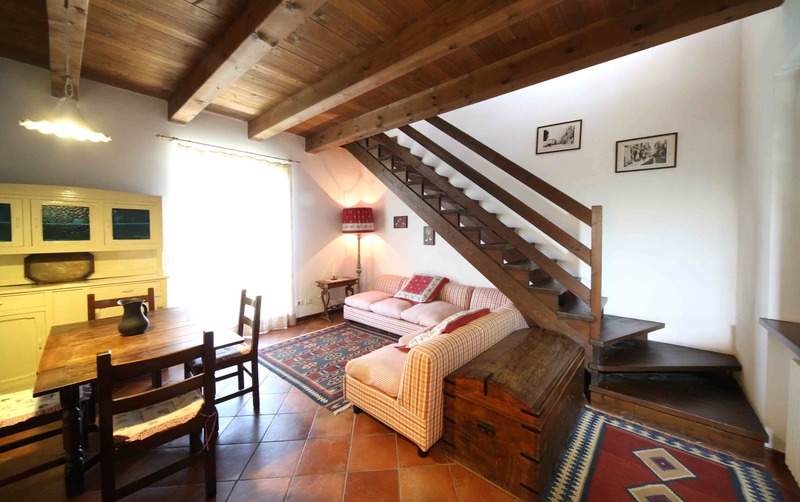 Ground floor of one the two apartments at Cascina delle Rose. 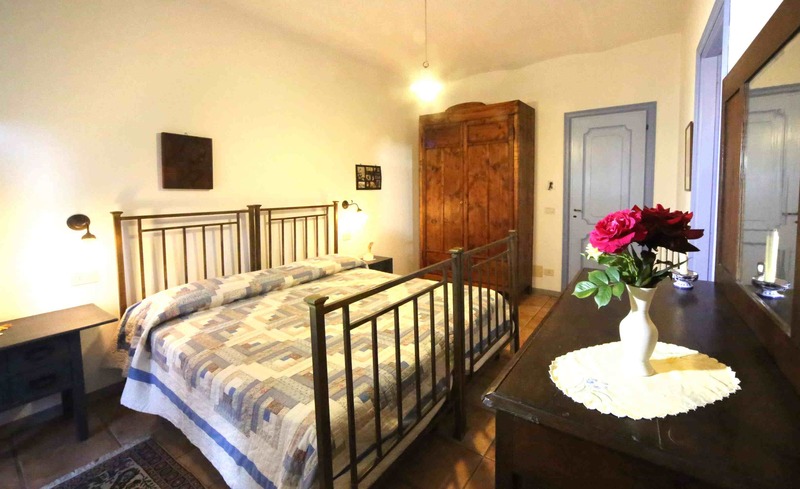 One of the cozy rooms at Agriturismo Cascina delle Rose. Giovanna’s captivating stories of her nonna Beatrice inspired me to begin an odyssey I’m still on: committing to paper many of the stories the Langhe’s and Roero’s strong women. Giovanna’s story is one of courage and unyielding determination in the face of Barbaresco’s patriarchal society buried like the vines deep in Langhe clay. 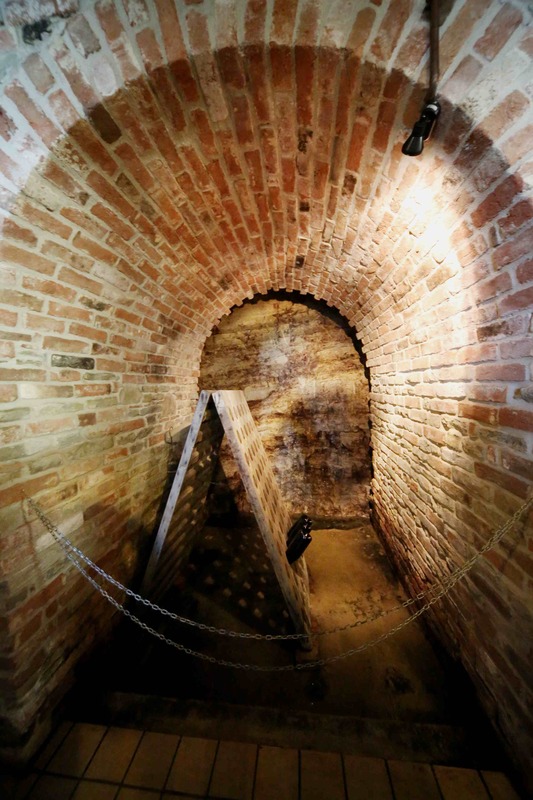 As the first woman to own and run her own winery in Barbaresco, Giovanna surmounted many obstacles and avoided trapdoors on her climb to success. But today, with her small family Giovanna, has succeeded in garnering accolades for her wines from across the globe. 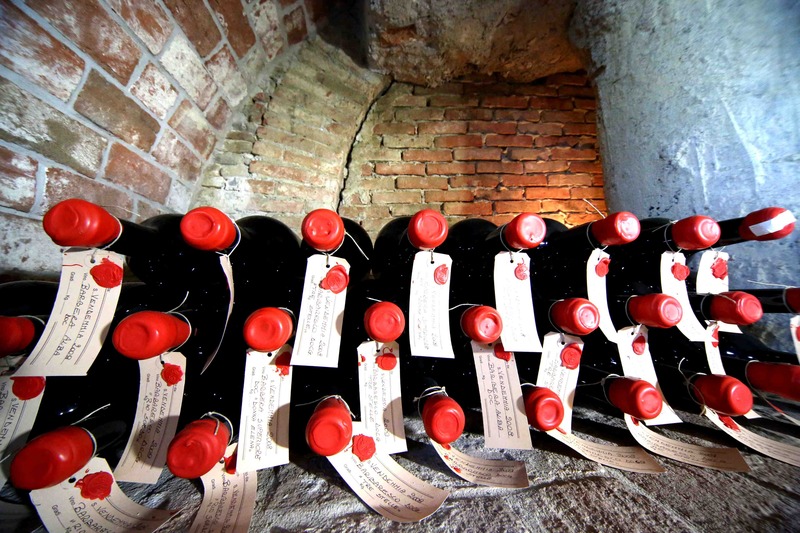 Magnums of Barbera d’Alba in the cellar of Cascina delle Rose, waiting for the right moment to be enjoyed. This year, given the difficult summer growing season – cool and somewhat wet – I asked Giovanna to keep a “day-in-the-life” diary of the harvest. Mamma Natura is smiling on them now, giving them more sun and warmer temperatures. If she continues her generous gift of good weather, the increased hang time for the Nebbiolo grapes will yield a lovely crop from which Giovanna will begin to work magic in her cantina. 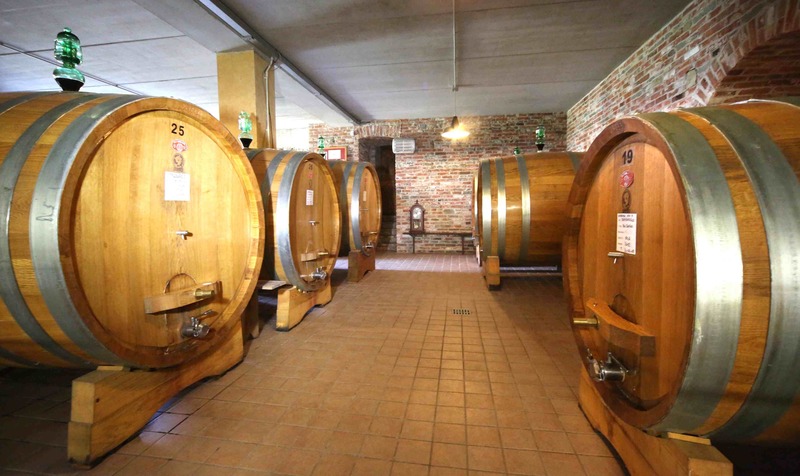 Big format oak barrels in the cellar of Cascina delle Rose. Since Cascina delle Rose only produces red wines, their harvest work in the vineyard begins a little later than those wineries with whites, but preparations have been underway to prepare for harvest when the grapes tell them it’s time to head home. 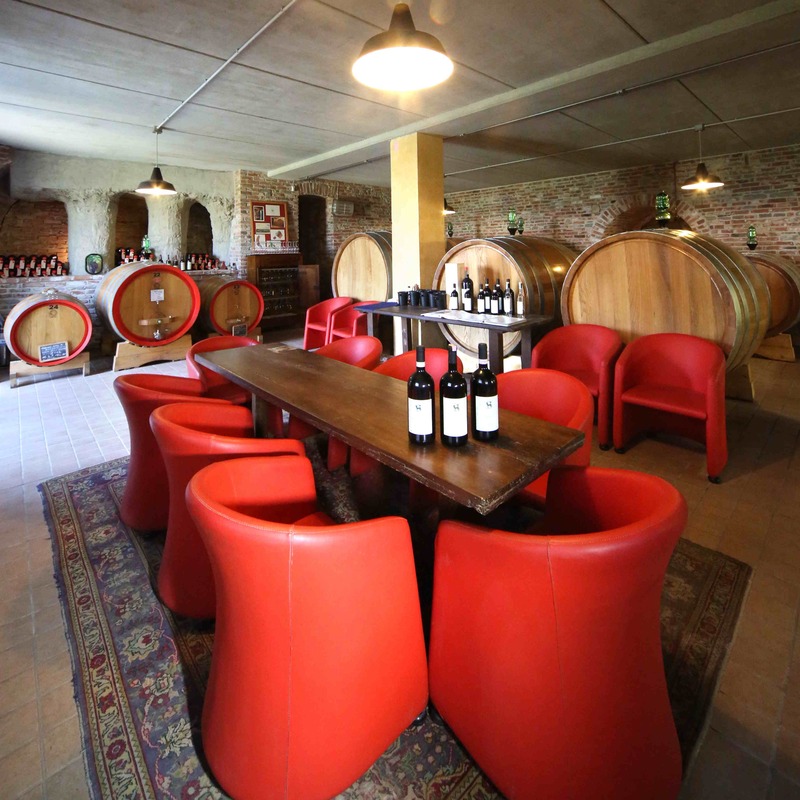 Cozy tasting room is a great way to learn about and enjoy Cascina delle Rose wines. 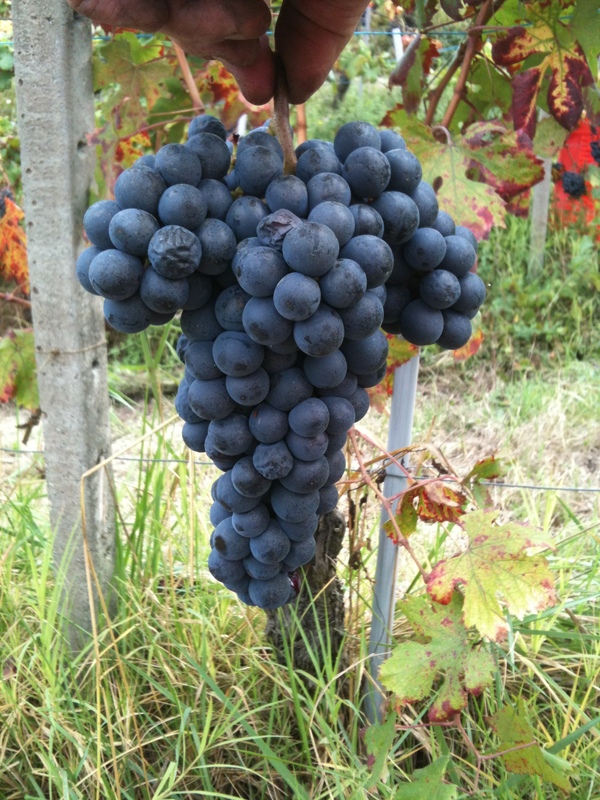 16:00 – We finished sampling Dolcetto grapes from Tre Stelle and Rio Sordo crus. Monday, September 15th – The Harvest Begins! 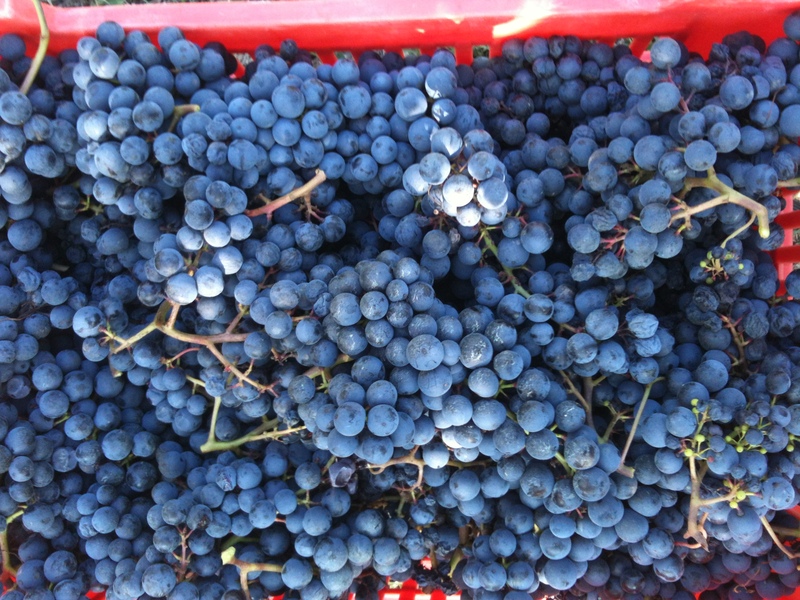 08:00 – The results of the analyses of the Dolcetto grapes arrived. We decided that today is the best day to start the harvest. 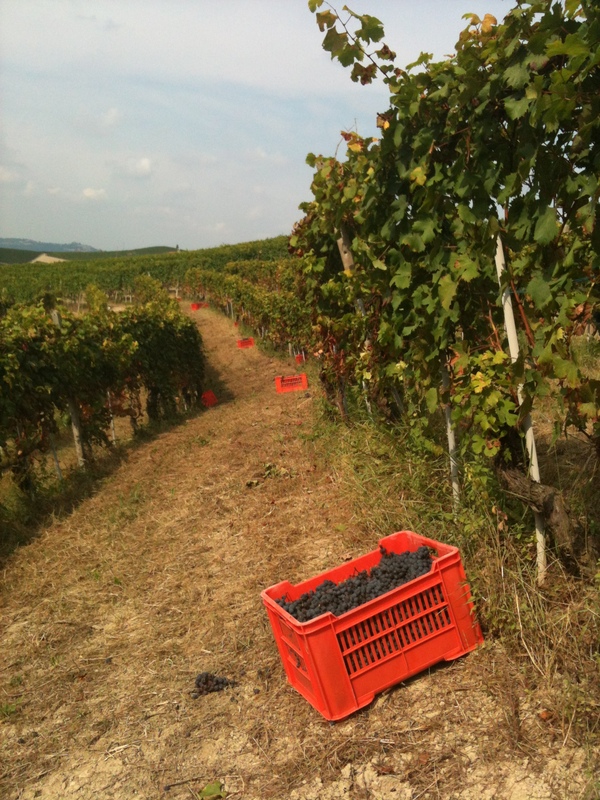 08:20 – The 2014 harvest begins with Dolcetto’s Tre Stelle vineyard! Observation – The weather is great! 12:40 – We need a short lunch break! 13:00 – We return to the vines; the harvest continues. Observation – The afternoon is warm and sunny. 17:30 – We are starting good. Not much more to pick in the old vineyards of Tre Stelle. Dolcetto grapes from the Tre Stelle vineyard, the first grapes of the 2014 harvest. 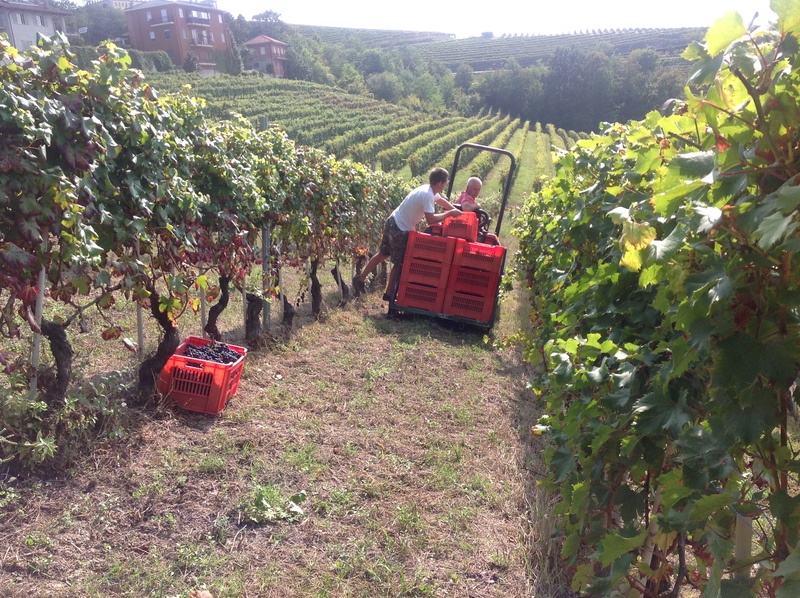 18:30 – The vineyard is finished, so not the guys are collecting the boxes. 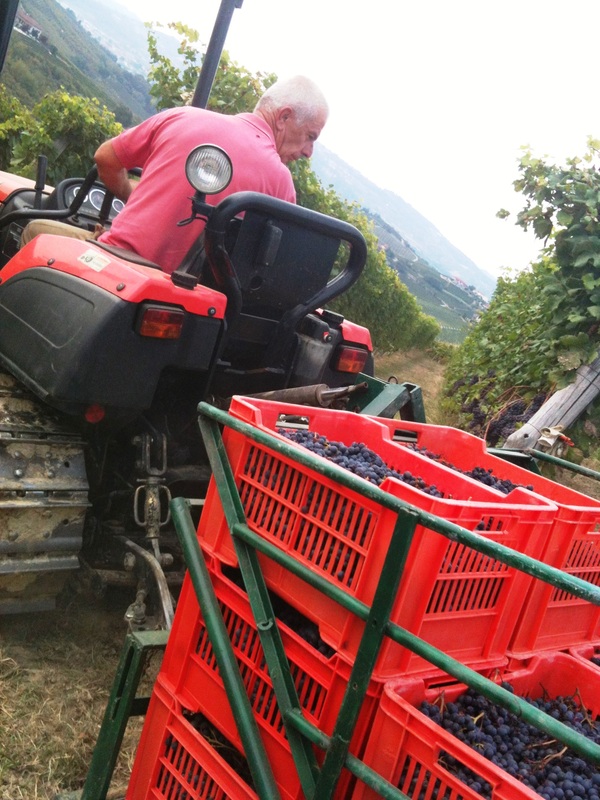 Italo carefully driving crates of Dolcetto grapes from the vineyard to the cantina. 19:00 – We are preparing the entire staff for crushing process. Some clouds in the sky, but no rain yet. 19:15 – We are now ready to crush the first vineyard harvested in 2014! 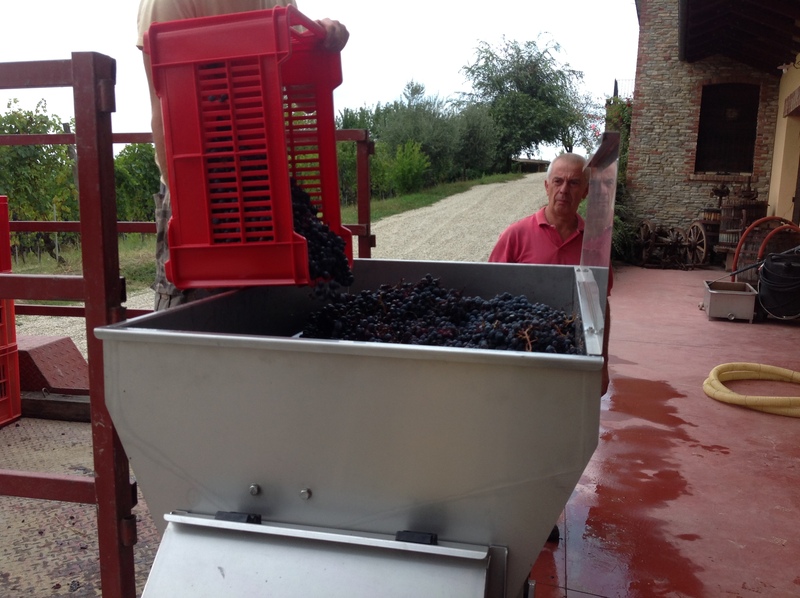 Italo watches carefully as the first boxes of Dolcetto grapes are poured into the crusher. Testing the samples of the crushed Dolcetto grapes from Tre Stelle vineyard. 21:00 – The Agriturismo’s guests are all out for dinner, so Giovanna starts cooking: pasta with home ragù and Dolcetto 2012 is on the menu this evening. From the crusher to the tanks. Observation – The first day ended with a thunderstorm in the Barolo area. Barbaresco was luckier since no rain arrived. Not so tired. The guys know that the hardest work will arrive within approximately 15 to 20 days when the Barbera and Nebbiolo will be ready to come home. Note of the day – The grapes – that have very sensitive skins and stems – seem to have suffered a bit in the strange summer. But with no hail and great September weather, they will have a great balance, but sugar level is a little lower than in past years. 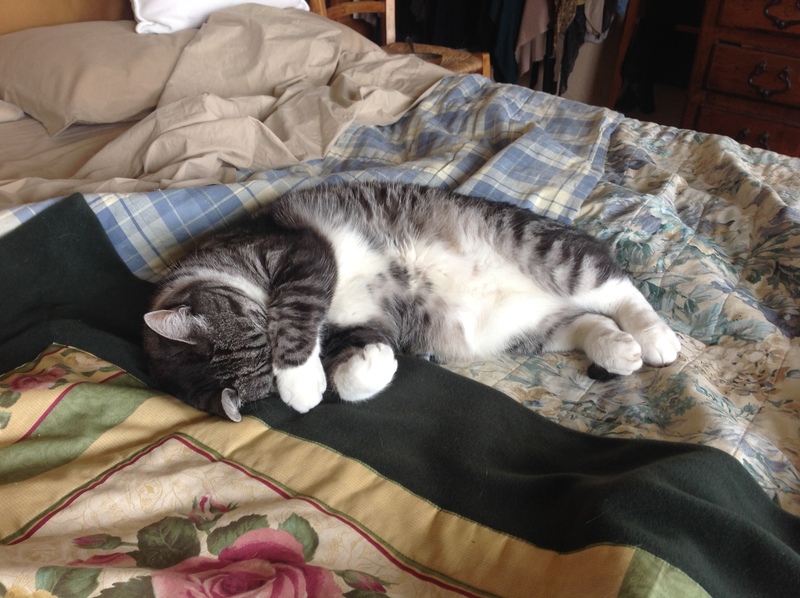 Lazy kitty Jack is not ready to see the dawn and get to work. 08:00 – While Giovanna and Riccardo are busy with the Agriturismo’s guests, Davide and Italo start with the Dolcetto’s Rio Sordo vineyard, the only one located just a few meters from home. The guests will join the guys in the vineyard later. Clusters of Rio Sordo vineyard Dolcetto grapes ready for picking! 12:20 – Lunch break! A few panini and a tiny bit of relaxing. 12:40 – Back to the Rio Sordo vineyard. 13:00 – Davide’s wife Simona joined us for the harvest. 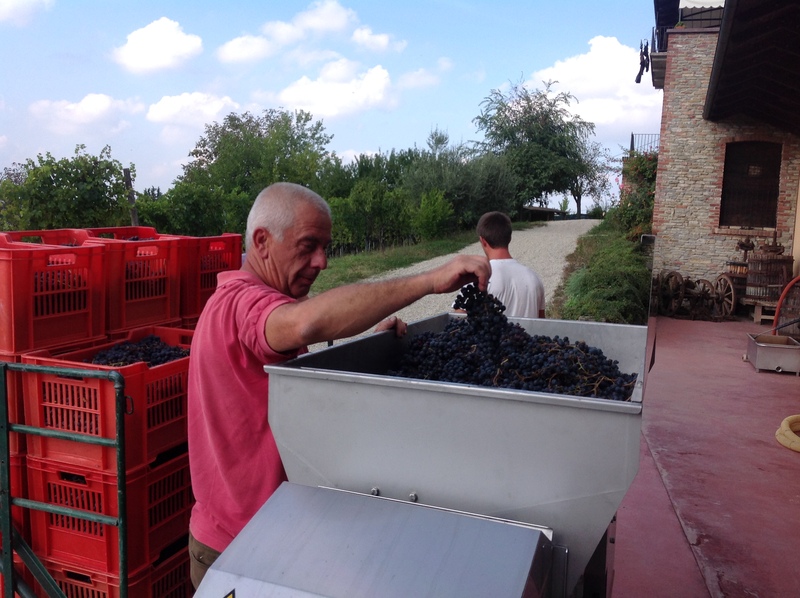 18:45 – Dolcetto 2014 harvest is ended and the guys will start to collect the boxes of grapes. Boxes of carefully picked grapes are collected and driven to the cantina for crushing. The process begins again. 19:30 – We are now ready for crushing. Italo once again dropping bunches of Dolcetto grapes into the crusher. 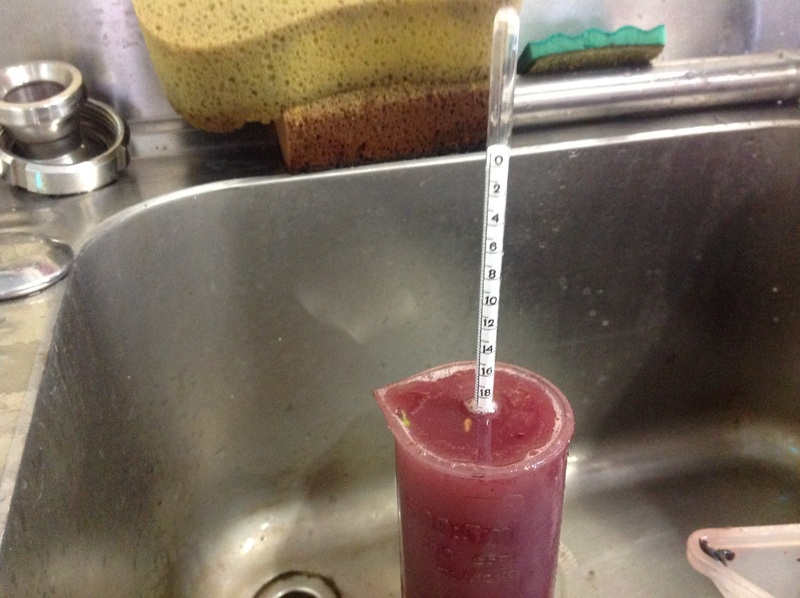 20:10 – Dolcetto crushing is finished and samples done (22°C – Babo 19.80) J!!!! Testing samples of crushed Dolcetto grapes from the Rio Sordo vineyard. 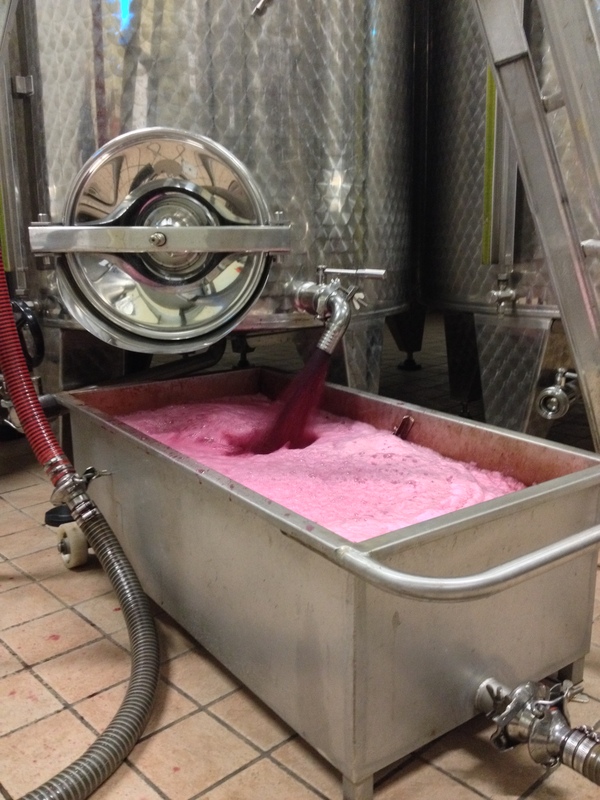 20:15 – It seems that the Tre Stelle vineyard is wanting to start with fermentation. Maybe tomorrow? 20:30 – Preparing to go out for the evening with Elizabeth Page (Giovanna’s “American sister” – our Dolcetto label is dedicated to her!) and Alan to celebrate his birthday. A totally relaxing evening tonight! Note of the day: We had great weather. Quite chilly in the early morning, but the day developed very well; 25°C (77°F) in the afternoon. 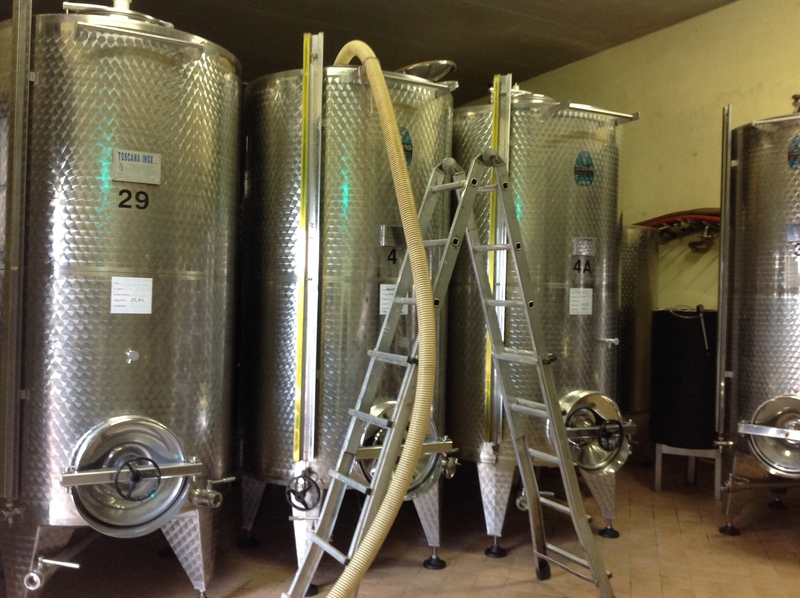 Observation – As expected, Tre Stelle vineyard grapes slowly begin fermentation. 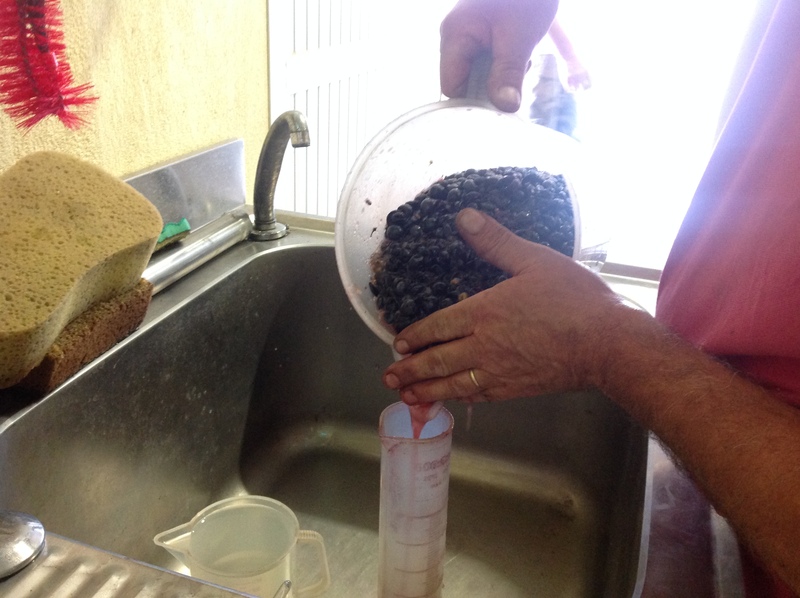 Observation – The crushed Rio Sordo Dolcetto grapes begin their fermentation. Nice color and a great bouquet are developing. Three times a day, we conduct a soft and long pumping-over. 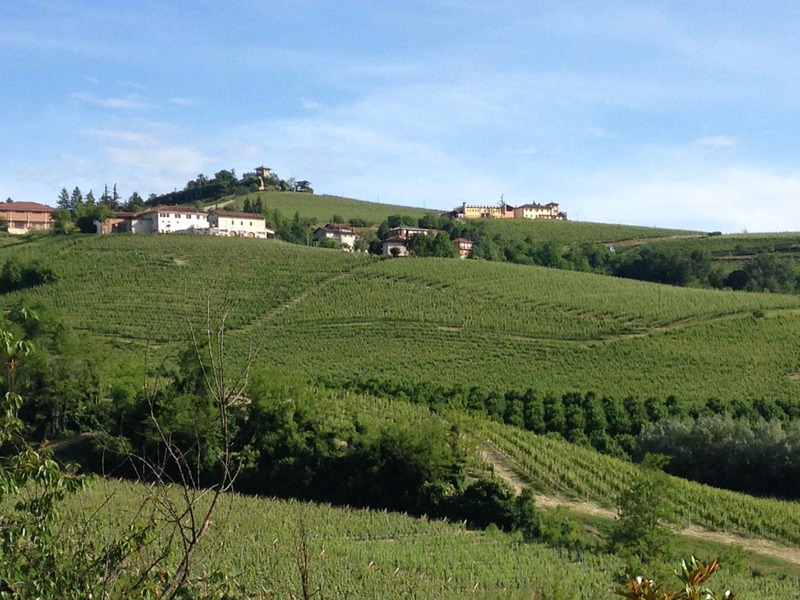 Stay tuned….much more to come from Cascina delle Rose in Barbaresco!